In the emergency room at Phoenix's Children's Hospital, they're used to treating some of the worst cases of child abuse. Still, pediatric nurse practitioner Amy Terreros is shocked at what's coming through the doors these days. "We have seen an increase not only in the number of cases we have seen but in the severity of the cases," Terreros said. Terreros and her team are being overwhelmed by a spike in the number of cases. In the first four months of this year, they've seen abuse cases increase 40 percent over the same time last year, from 45 in 2008 to 63 in 2009, reports CBS News correspondent Sandra Hughes. "The numbers are going up and some of the families, what they are telling us tells me that the economy is playing a part in it," Terreros said. The recession has hit especially hard in Phoenix. Housing prices have dropped 50 percent. Foreclosures have left neighborhoods looking like ghost towns. "Recently two of the cases that I had, it was a father who was normally the one working who all of sudden lost his job and now he was the primary care taker of the child and he had never been in that role and then the children came in with injuries," Terreros said. "And in that particular case, what was the explanation?" Hughes asked. "He just lost it?" "There was no explanation," Terreros said. "It's still denial." When caregivers' explanations don't match the injuries, Terreros and her team work like detectives, looking at scans and x-rays to tell the child's story. And what they uncover can be upsetting. 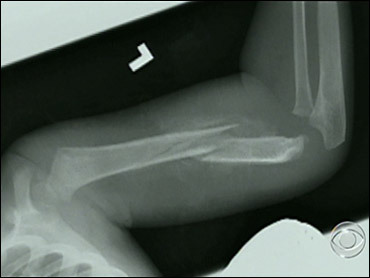 "So this poor kid was walking around with a broken arm?" Hughes asked while Terreros was looking at an x-ray of broken bones. "Well he probably wouldn't have been walking," Terreros said. "Go and look at the next slide. This is the other arm. Look at this new bone here." "Two broken arms?" Hughes asked. "Two broken arms," Terreros said. "This is his left leg and you can see here he has an old fracture and also on his right leg he did." "Two, that almost makes me cry," Hughes said, her voice cracking. The spike in child abuse cases isn't isolated to Phoenix. At children's hospitals across the country, there is growing alarm. At Boston's Children's Hospital the number of cases screened rose 20 percent last year. At Seattle Children's Hospital, a 27 percent increase in confirmed cases. In Beaufort, S.C., a 63 percent increase so far this year. All believe the economy is playing a major role. These children are among the statistics. And this is their mother. "Sometimes I have to walk away because I know that if I start to hit one of them, it probably wouldn't stop," said one abuser. She's a single mother of four who doesn't want to be identified, and says after losing her home to foreclosure, she became abusive and gave her daughter a black eye. "I went into her room with a spatula and spanked her," she said. "I had to hold her down on the ground to do it and I had to use more force than I've ever had to use on any of my kids." She's now in counseling to control her anger, despite her financial situation. Some experts say it's not economic stress leading to an increase in child abuse cases, but better reporting by hospitals. But there is no denying that vital funding to prevent child abuse is drying up. Several states have proposed or already made cutbacks to programs this year, like the Crisis Nursery in downtown Phoenix, which must now turn away children in families considered to be high risk. "We have a waiting list of probably 50 to 70 youngsters whose parents want their kids to be here," said Marsha Porter, the executive director of Crisis Nursery. Eva Estes was awarded temporary custody of her granddaughters after the state separated them from their parents because of drug use and neglect - a claim their mother denies. Estes is worried about the girls going back to live with their mother. "What's going to happen to my granddaughters when they do go back, if they go back?" Estes asked. "Is anybody from CPS going to check up on them once a week, once a month, if ever?" She has reason for concern. Budget cuts forced a 15 percent reduction in Child Protective Services staff - that's 159 case workers. Now low-level complaints, often the first sign of abuse, will be ignored. "No one is going to check out to make sure if those kids are OK?" Hughes asked Gary Arnold, with Arizona's Child Protective Services. "And believe me it was gut wrenching decision to make, nobody wanted to make that decision, but it was necessary," Arnold said. Back at the Phoenix Children's Hospital, when they see a child with cuts, they know exactly what those cuts could mean - and they feel powerless. "A child is left in an unsafe situation and then they come in here, critically ill," Terreros said. Her team can only heal the immediate wounds. The long-term scars will last far beyond the recession.